When we went to Kalalasi Village in August 2007 to build the Health Centre we were determined to introduce the water harvesting idea to the villagers, who are now suffering from severe droughts. The rain patterns have changed drastically in recent years. The rainy seasons have become shorter and more intense. When it pours there is water everywhere, even in places where it is not needed. This is bad for farming and when the skies clear what crops there are wither on their stalks. In the past rain came in small doses over a long period and the crops grew with out needing irrigation. This was just right for farming and for the water sources. Nowadays the village has seven boreholes, which used to function. 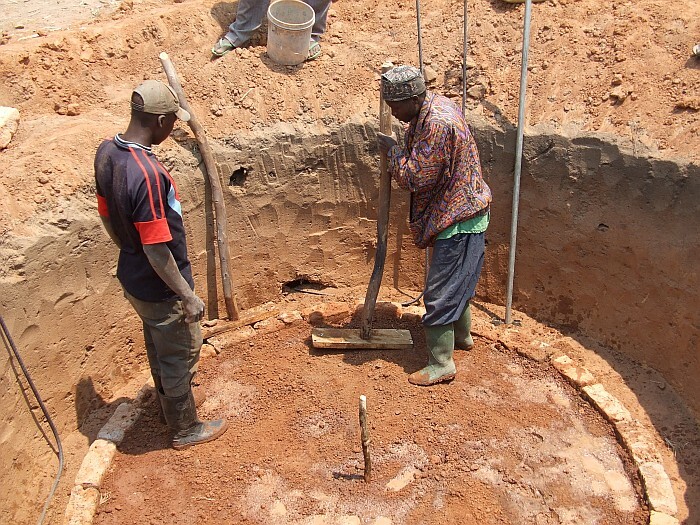 The water table has sunk and now, in the long dry season, only one of these boreholes produces water. Villagers rise early to get water but the supply is erratic and often the children miss school while they queue for water. When we visited in 2007 we prioritised water harvesting alongside building the Health Centre. Not only to help the clinic, but also to encourage the school, churches and villagers with corrugated iron roofs to capture rainwater and store it for use in the dry season. A water engineer we met in Winchester gave us plans. The villagers were involved in the planning and logistics of building the two tanks. Having guttering, down pipes and tanks is a new idea which we hope will take on in the village and surrounding areas. In the future we intend to introduce ways of capturing water in the ground with small dams, ponds etc. to make the farms productive again. If there are any water engineers out there who want to get involved with hands on development, and have their own funding, please get in touch.